Russian investigators have launched a probe into why a Soyuz rocket failed shortly after blast-off, in a major setback for Russia's beleaguered space industry. US astronaut Nick Hague and Russian cosmonaut Aleksey Ovchinin were forced to make an emergency landing after the incident on Thursday, but were rescued without injury in Kazakhstan. Russian officials said they were launching a criminal investigation into the accident, the first such incident on a manned flight in the country's post-Soviet history. The Russian space industry has suffered a series of problems in recent years, including the loss of a number of satellites and spacecraft. Officials said they would suspend manned launches in light of the latest accident. 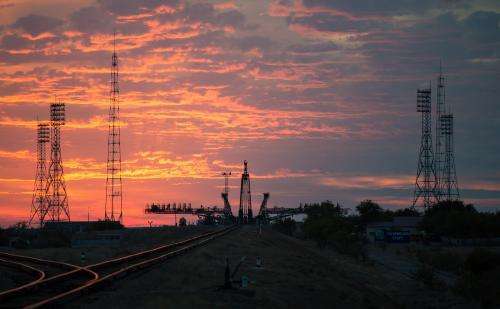 "An accident with the booster, two minutes, 45 seconds," the voice of Ovchinin could be heard saying calmly in live-streamed footage of the launch from Kazakhstan's Baikonur cosmodrome. The incident came as the rocket was travelling about 4,700 miles (7,500 kilometres) per hour, just 119 seconds into the voyage, according to NASA. "Shortly after launch, there was an anomaly with the booster and the launch ascent was aborted, resulting in a ballistic landing of the spacecraft," the US space agency said in a statement. The descent was sharper than usual, meaning the crew were subjected to a greater G-force, but they were prepared for this scenario in training, according to a commentator on NASA's video livestream of the launch. "We're tightening our seatbelts," Ovchinin said in the video. "That was a short flight." Rescue workers reached the site of the emergency landing and evacuated Ovchinin and Hague. Photos released by Russian government and NASA Twitter accounts later showed the men embracing their families and enjoying a hearty Russian meal back on the ground. Russia is currently the only country taking crew to and from the ISS. The European Space Agency, whose astronaut Alexander Gerst is on the ISS, said in a statement that "the aborted launch will have influence on the planning for the near future". Stefan Beransky, editor of the specialist Aerospatium magazine and author of a book on the Soyuz rocket, said now "the main problem is that there are two fewer people at the station". "As we wait for the conclusions of a Russian probe, the Soyuz will perhaps be grounded for some time," he told AFP. Russia's Investigative Committee said a criminal probe would seek to determine whether safety regulations had been violated during construction, causing major damage. "Officials are currently examining the launch site, documents are being seized," it said in a statement. "Thank God the cosmonauts are alive," Russian President Vladimir Putin's spokesman Dmitry Peskov told journalists. Kenny Todd, operations integration manager at the International Space Station said he "had every confidence that our Russian colleagues will figure out what's going on". In 1975, Oleg Makarov and Vasily Lazarev made a successful emergency landing in Siberia's Altai mountains following problems during booster separation. Vladimir Titov and Gennady Strekalov survived a fire during launch in Kazakhstan in 1983. Former military pilots Ovchinin and Hague had been set to join the ESA's Gerst, NASA's Serena Aunon-Chancellor and Sergey Prokopyev of Roscosmos following a six-hour flight. The International Space Station—a rare point of cooperation between Moscow and Washington—has been orbiting the Earth since 1998. Russian space officials have said they are investigating whether a hole that caused an oxygen leak on the ISS was drilled deliberately by astronauts. The hole was detected in August and quickly sealed up, but Russian newspapers said Roscosmos was probing the possibility that US crewmates had sabotaged the space station to get a sick colleague sent back home. Dmitry Rogozin, a firebrand nationalist politician who this year was appointed by Putin to head Roscosmos, said a "thorough investigation" was needed after the failed launch. "It's a dramatic situation but it was possible to avoid a very much worse turn of events," he said in televised remarks. The politician has clashed with the US, suggesting American astronauts should use trampolines instead of Russian rockets to reach the ISS after Washington imposed sanctions over Moscow's 2014 annexation of Crimea.